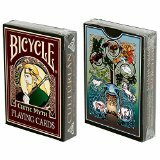 From the worlds of mythology, folklore and legend, Celtic Myth Playing Cards are a custom Bicycle® playing card deck celebrating the rich Celtic pantheon of mythological Gods, Goddesses, and heroes. 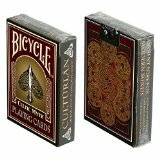 Product detail: 52 card poker deck plus 2 jokers and 2 info cards. Linen textured finish.